Stainless steel and glass railings are undoubtedly the most popular choice in Canada today. Glass railings have been preferred by commercial property owners for decades now. The aesthetic advantage has been the primary reason. Homeowners have endorsed the same aesthetic advantage with the additional attributes of durability, affordability and ease of maintenance among other reasons. However, there are different qualities of stainless steel and glass. Not every manufacturer or dealer will offer you the best materials. You would be able to enjoy the real benefits of stainless steel and glass railings only when you choose the best materials and the best installers. There are many types of stainless steel and they would have varying resistances to corrosion, heat, welding and machining. The certification will help you identify the chemical composition, mechanical and physical properties, the typical application and reasonability of the cost. Stainless steels can be austenitic, ferritic, duplex, martensitic and precipitation hardening. You would find more than two dozen variants of stainless steel within these classifications. 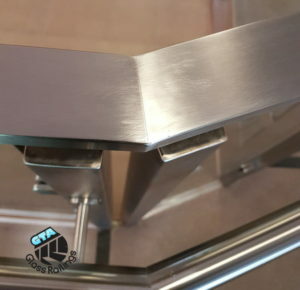 You should consult an expert to choose the best type of stainless steel for railings. Your choice of railing company should be influenced by a few factors including where the company sources its raw materials or supplies from, where they manufacture and how, whether or not they make their own handrails and posts. You should hire a company that uses local Canadian suppliers and manufacture their own posts and handrails. That is the only way you can be certain of the quality and hold the company accountable. Like stainless steel, glass comes in different variants as well. The types relevant to railings are tempered glass, laminated glass, frosted glass and tinted glass. There are other varieties or grades you can choose from but these are the primary and more popular options. You may want to go for tempered and laminated glass, not in isolation but combined, for outdoor glass railings. You can have frosted glass where you need a bit of privacy. Tinted glass works well when you want privacy and want the glass to absorb heat from the sun. There is insulated glass too. Hire a railing company that makes its own components and do their own installations. Don’t hire subcontractors and don’t hire companies that wouldn’t be offering the services assured in the warranty. You need a full-suite service from a company specializing in stainless steel and glass railings in Canada.